I don’t usually go out of my way to try new beers from New Belgium, but in my central Illinois city there is very little beer variety in the local liquor stores (I go out-of-town to stock up). 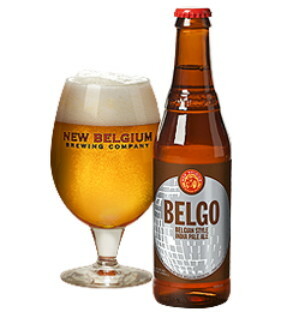 On Super Bowl Sunday I found myself browsing through the usual suspects at the local store, and decided to go with novelty instead of reliability in picking up a six pack of New Belgium’s new “Belgo” Belgian IPA. After sampling it, I’m happy to say that I don’t regret the decision. NOTES: 12 oz bottle poured into a tulip glass. APPEARANCE: Somewhere between straw and gold, very clear and pretty, with a finger and a half of pillowy foam that mostly faded in about five minutes. NOSE: Very funky and “Belgian-y,” with aromas of straw and banana in particular, and maybe some black pepper. The hops do not come through strongly at all for something with IPA in the name. TASTE: Very fruity, with a sweetness like wildflower honey, and flavors of banana. Maybe a little oversweet. Hop bitterness is there, if faint, but hop flavor is lacking. Again, there’s a bit of pepper taste. The biggest question is the lack of hops. MOUTHFEEL: Medium-bodied with APA-like bitterness. A little on the rich side. DRINKABILITY: I drank a number of them at the Super Bowl party, so it can’t be that bad, can it? Overall, I would say it’s a little too unbalanced toward malt and Belgian funk for me to drink all night. SCORE: 3 hops. I decided to give this beer a positive score because I still like it as a saving grace, even though I feel it’s a little off-style. If I had made this in my homebrew kitchen, though, I wouldn’t have called it a Belgian IPA. I would have said it tastes more like a saison, or even a non-wheat beer brewed with hefeweizen yeast. But if you like that range of Belgo-German flavors, there’s probably something worth checking out for you here. I won’t have any trouble disposing of the last few in my fridge. Not the best beer I’ve had from New Belgium, but certainly not the worst. Posted in Tasting Notes.Tagged belgo ipa, New Belgium, new belgium belgo, New Belgium Brewing. I found it had a slight mineral or metallic taste floating around up in there (particularly in the aftertaste). But I still like it OK. I would drink it again if handed one, or would buy it again in a pinch. Of course, I will drink almost anything I am handed or will buy just about anything in a pinch…but with this I would do so without much regret. I still have some in the fridge, so I’ll look for those flavors next time I crack one. Previous Post 2/10/2012: WHAT ARE YOU DRINKING TONIGHT?